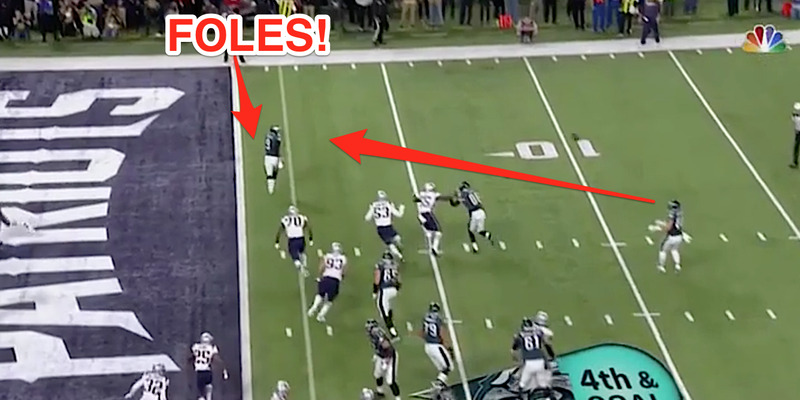 The Philadelphia Eagles ran a trick play that resulted in a touchdown for Nick Foles. The Eagles snapped it to running back Corey Clement, who flipped it to tight end Trey Burton, who hit Foles in the end zone for a touchdown. The score put the Eagles up 22-12. The Philadelphia Eagles showed the New England Patriots how to get their quarterback a catch in the Super Bowl. In the same quarter that Tom Brady dropped a pass on a trick play to get a first down, the Eagles ran a trick play to perfection to get Nick Foles a touchdown. Going for it on 4th and goal with the first half coming to a close, Nick Foles slyly moved out of the way of the snap, which instead went to running back Corey Clement. Clement took the snap and flipped it to tight end Trey Burton, who then tossed a perfect lob to Nick Foles for a touchdown. A beautiful setup that, win or lose, will go down as an all-time great play in the Super Bowl. The Eagles took a 22-12 lead.